I've written here before that twenty years ago I accumulated an archive of about 24 hours worth of East African music on 10" tape reels that I finally got around to digitizing a year and a half ago. These records were loaned to me by friends from that part of the world, most of whom have moved on to other cities, and cover a gamut of languages and styles. Digitizing this material was fairly straightforward, but actually processing, organizing and making sense of the collection has been a daunting task, one that I've pursued in whatever spare time I've had. It's complicated by the fact that the various genres and artists are scattered among the tapes willy-nilly.
. . . Although distinctive melodies distinguish Kamba pop from other styles of benga, there are other special Kamba features. One is the delicate, flowing, merry-go-round-like rythm guitar that underlies many Kamba arrangements. While the primary guitar plays chords in the lower range, the second guitar plays a fast pattern of notes that mesh with the rest of the instrumentation to fill in the holes. This gentle presence is discernible in many of the recordings of the three most famous Kamba groups: The Kalambya Boys & Kalambya Sisters, Peter Mwambi and his Kyanganga Boys and Les Kilimambogo Brothers Band, led, until 1987, by Kakai Kilonzo. It turns out that I have quite a few tracks by the Kilimambogos, almost none of which are on the two recent compilations Best of Kakai Vol. 1 and Best of Kakai Vol. 2, so you can assume I'll be devoting a future post exclusively to them. 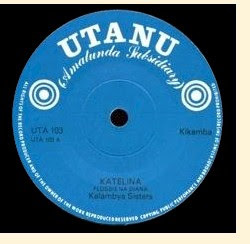 Tunes by various other Kamba musicians (most recorded around 1983) add up to about three hours' worth of music, and the ones I'm posting here are a representative sample. If you like these I'll be happy to post more in the future. . . .I soon found that this was very much a people's music. The hip young Kenyans moving into government and the professions were uneasy with its reminder of the Swahili-speaking, makeshift past, more happy with the sophistication of Zaïrean music and English-language pop and rock 'n' roll. True, compared with the work of the great names of Kinshasa, the discs cranked out of the scruffy record stores of River Road, down near the country bus station, were simple and sometimes seemed naïvely optimistic. 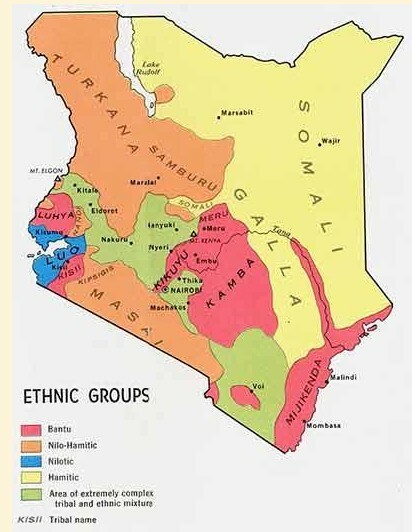 But for the majority of Kenyans whose English was functional at best, they reflected day-to-day life with a plain-man exuberance that was very like their audience: lacking the glamour of West or Central Africa, but in their own way wholly admirable. . . In this light I regret that I've been unable to find anyone to translate the lyrics of these records for us. I'm sure they would be even more pleasurable if we knew what they were about! As it is there's plenty of wonderful singing and guitar-picking for our musical enjoyment. Kaiti Brothers - Nau Wakwa "J"
"Kibushi" was a dance craze imported from Congo/Zaire, the most important exponent of which was the Orchestre Hi-Fives. Here's a Kamba version of Kibushi which doesn't bear much resemblence to the original style. These tracks are the A & B sides of Akamba AS 801. I know nothing of Fadhili Mundi & the Ithanga Brothers, but these are certainly enjoyable tunes, especially the delightful "Wakwa Sabethi." Fans of East African 45s know that looking at their colorful labels is almost as much fun as listening to them. Unfortunately, I haven't been able to provide you with scans of these recordings, but KenTanza Vinyl has an excellent gallery for your enjoyment. 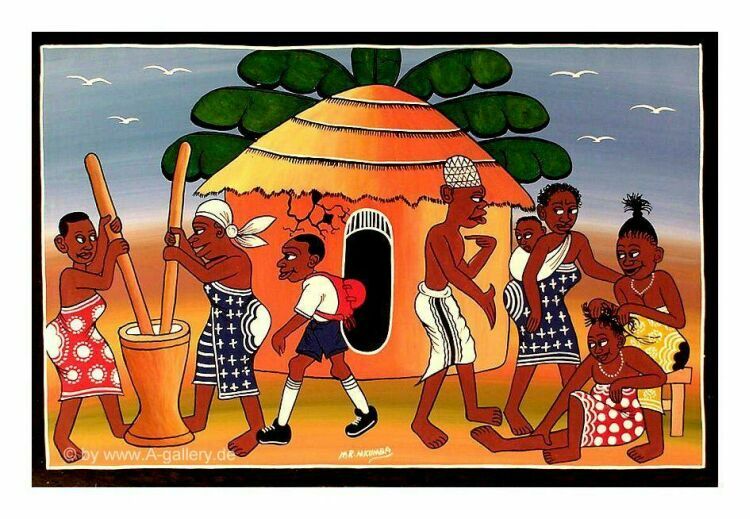 The picture at the top of this post is entitled "My Neighborhood" and is by a Tanzanian artist named Mkumba. Explore more of his work and that of a number of other excellent East African artists here.